It is a beautiful ring and the fit is great! The new skull ring is awesome... looks great, deliverie was fast .Fits my big fingers perfectly,Thanks team Treadhim. It is very light and the actual product is very well made. 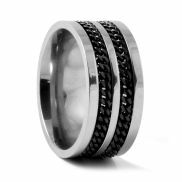 Here you'll find our entire collection of men's rings, all made from the finest materials including titanium, tungsten, ceramics and stainless steel. Use the menus below to find your way through our vast selection. At the bottom of the page is our easy-to-follow guide with instructions on how to measure your finger's circumference properly for that perfect fit. There's more to men's rings than just wedding bands. Rings make a bold fashion statement and are an extension of your personality, for all to see and admire. The wonderful materials used in crafting our rings, and their incredible designs, from classy to quirky and everything in between, ensure you'll find all the rings you need to complement your unique style. Keep reading for a quick overview of the materials used to make our rings, all tested for nickel, of course. Safety first! The section headed "Dimensions" indicates the size of each individual ring. The most common sizes fall between 6 and 8mm. For example, a standard wedding band would be 6mm in width. Larger rings of 8mm usually have more showy designs and can even be worn on your thumb. It's really up to your taste in hand jewelry. Stainless steel is a metal alloy made from iron, chromium and carbon. Stainless steel is used in everything from cookware to jewelry. Subsequently, there's a whole range of different qualities out there. At Trendhim, though, we only use the best for our steel rings and that's 316L stainless steel, also known as surgical steel. 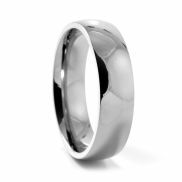 Stainless steel rings are the most common and popular rings for men. Titanium is a relatively new material when it comes to jewelry. Titanium rings are made in two different grades, either 90% or 99.2% titanium content. At Trendhim, we only sell the 99.2% content variety, also called "pure titanium." Titanium has the highest strength-to-weight ratio of all metals. Titanium is as strong as steel but much less dense. Titanium is extremely durable, even more scratch-resistant than steel, and highly resistant to corrosion. Titanium rings weigh half as much as steel and are very comfortable to wear. Titanium is also hypoallergenic, great news for those of us with sensitive skin or allergies to certain metals. Sterling silver is made from 92.5% pure silver and 7.5% copper or some other metal alloy. Pure silver on its own is too soft to make jewelry with, so usually copper is added to make it rigid enough to hold its shape. Sterling silver is very popular for wedding and engagement rings because of its shiny luster. Any ring made from sterling silver will look beautiful on your hand. Of course, as with any product made from sterling silver, it does require a little polishing every once and a while to maintain its sheen. Tungsten weighs 4 times as much as steel and is twice as hard. Definitely a good material for solid, masculine rings. Tungsten rings are very hard to scratch and stay shiny forever. That's because tungsten is much denser that steel or titanium. As hard as ruby stones, tungsten can only be polished and finished with diamond compounds. Be aware that some manufacturers produce tungsten rings that are actually tungsten and cobalt alloys and thus are of inferior quality. At Trendhim, we only sell cobalt-free tungsten rings. Ceramic is an extremely lightweight material that is nonetheless very strong. Ceramic tiles were, after all, used on space shuttles to protect them during the harrowing re-entry stage. Ceramic rings are also highly resistant to scratches and are comparable in quality to tungsten rings. Ceramics are definitely not fragile and are highly resistant to damage from chemicals. Ceramic rings are hypoallergenic, meaning that if you have sensitive skin or suffer from allergic reactions to some metals, ceramics are perfect for you. Trendhim does not carry rings made from pure gold because the price fluctuations in that precious metal have gone out of whack, no longer representing real good value. Gold is a relatively soft metal that needs lots of maintenance and is usually coated with a thin layer of rhodium, thus producing white gold that is shinier than pure gold. What we offer instead is a wide range of gold-colored strong metals such as surgical steel and titanium. At Trendhim, we show the inner circumference of the rings we offer in mm, US and UK sizes. For example, you'll see something like 62 / 10 / T ¹/₂, which means the ring has a circumference of 62mm, US ring size 10 and UK ring size T ¹/₂. If you're uncertain about your actual ring size, we recommend that you use the following method to get a reliable measurement. 1. Tie a piece of the thinnest possible string twice around your finger, making sure that it's nice and snug. 2. Draw a line as shown across the string. 3. Finally, measure the distance between the lines you made on the string in mm. The result is your ring size. So, for example, if you got 62 mm, then your size should be " 62 / 10 / T ¹/₂". Men's rings have gone through a mighty evolution in the last ten years, thanks to new technology that allows the production of some very creative designs with a myriad of patterns and specific themes to choose from. 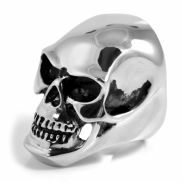 The rings now run the gamut from skull head rings to bling rings and just about anything in between. From over-sized skull rings worthy of blood-thirsty pirates to elegant masculine rings adorned with black zirconia stone, we're certain you'll find something in our collections that reflects your unique style and personality... for all the world to see.